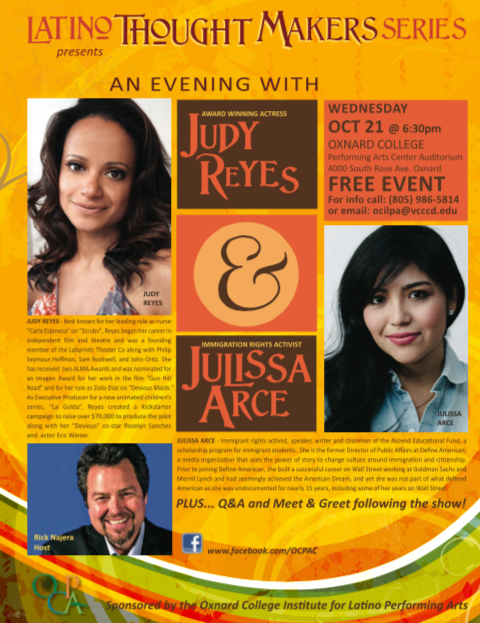 Oxnard College Institute for Latino Performing Arts presents a special evening with actress Judy Reyes and immigrant rights activist Julissa Arce with host Rick Najera on Wednesday, October 21 at 7:00pm as part of Oxnard College’s Latino Thought Makers series. Entrance to the event is free. Currently starring in Lifetime’s hit show Devious Maids, Judy Reyes is best known for her leading role as the sassy, no-nonsense nurse Carla Espinosa on the hit comedy series “Scrubs.” Among a long list of acting and producing credits, Reyes is also co-founder of the Sound of Gol Foundation; an initiative designed as a nonprofit to help other nonprofits all around the world through soccer and entertainment. Julissa Arce is an immigrant rights activist, speaker, writer and chairman of the Ascend Educational Fund. She is the former Director of Public Affairs at Define American, a media organization that uses the power of story to change culture around immigration and citizenship. Prior to joining Define American, she built a successful career on Wall Street working at Goldman Sachs and Merrill Lynch. Julissa is co-founder of the Ascend Educational Fund, a scholarship program for immigrant students. Latino Thought Makers Series, hosted by Hollywood award-winning writer-director-producer-speaker and comedian Rick Najera, is an important initiative designed to engage, educate and entertain students and the general public of Oxnard, Camarillo and greater Ventura County communities. The successful series has showcased the careers of the most prominent Latinos in Hollywood including actors Edward James Olmos, Esai Morales, the family of Cesar Chavez, the creator and cast of Hulu’s East Los High, Grammy-award winning band Quetzal and more. Coming November 12 to Oxnard College, nationally syndicated columnist Ruben Navarrette Jr. and award-winning journalist Julio Varela (Latino Rebels) visit Oxnard College for a special dialogue about politics today and topical issues effecting the Latino community. Oxnard College Institute for Latino Performing Arts presents Latino Thought Makers live hosted by Rick Najera featuring special guests Judy Reyes and Julissa Arce on Wednesday, October 21; Doors open at 6:30pm, Show at 7:00pm at Oxnard College Performing Arts Center, 4000 S. Rose Ave, Oxnard, CA 93033. Entrance and parking are free. RSVP to ocilpa@vcccd.edu for best seats.